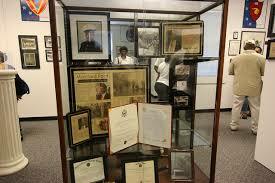 The Montford Point Marine Museum was established to preserve the legacy of the Montford Point Marines. Its mission is to collect, record, preserve and display relevant artifacts in a museum setting for public education and viewing. We have the largest collection of photographs, documents, papers; forever capturing the unique history of African American Marines from 1942 to 1949. 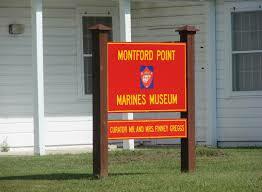 The Montford Point Marines Museum is housed on the hallowed grounds of Montford Point Camp in the East Wing of building M101, Marine Corps Base, Camp Gilbert H. Johnson, Jacksonville, NC. The Marines of Montford Point entered through its main gate as mere men of color, who had pride, courage and dedication. During the 1940s these men traveled a road that was not paved. They graduated to become Marines and brought the American people and the U.S. Marine Corps into a new era. Today many of the Marines who traveled through this groundbreaking period of American and Marine Corps history have contributed their life's successes to the pain, sacrifices, and rewards that were earned at Montford Point. The museum is temporarily closed to the public due to the damage caused by Hurricane Florence. Once repairs are made to the building and exhibits, we will reopen on Tuesdays and Thursdays 11:00 a.m. to 4:00 p.m. Other times will be made available by appointment. Please email the Museum Director or call (910) 554-0808 for any updates. ACCESS TO CAMP JOHNSON: A valid military identification card or a temporary base pass is required to enter Camp Johnson. This pass must be picked up at the main gate of Camp Lejeune. Call (910) 554-0808 for additional guidance. 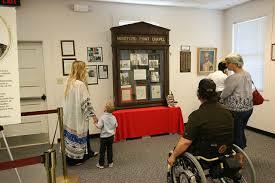 The Montford Point Museum is currently and constantly seeking material for future displays. We are looking for WW II photographs, diaries, personal and military objects, and other materials that reflect the lives, actions, and memories of the Montford Point Marines. If you have artifacts, there are two methods of donation. The first way is as a permanent gift, and the second way is as a short term or long term loan. In all cases material will be handled with care, protection, and above all else with respect. Items gathered during these drives will be used by the museum and will be made available to historians, researchers, and the general public for the advancement of historical preservation and awareness.